The Java Authentication and Authorization Service (JAAS) was introduced as an optional package (extension) to the Java 2 SDK, Standard Edition (J2SDK), v 1.3. JAAS was integrated into the J2SDK 1.4.
for authorization of users to ensure they have the access control rights (permissions) required to do the actions performed. Traditionally Java has provided codesource-based access controls (access controls based on where the code originated from and who signed the code). It was not able to enforce access controls based on who runs the code. 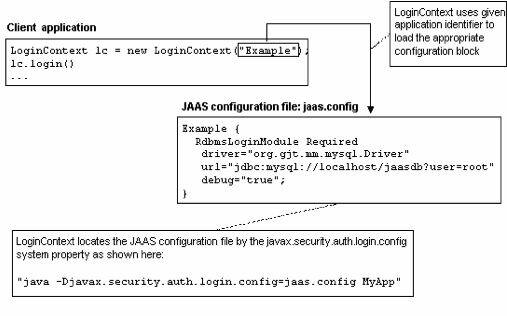 JAAS provides a framework that augments the Java security architecture with such support. It implements a Java version of the standard Pluggable Authentication Module (PAM) framework. It is possible to develop or import new modules. JAAS is pluggable; this permits applications to remain independent from underlying authentication technologies. Any authentication technology can be plugged under an application without requiring modifications to the application itself. Once the user or service executing the code has been authenticated, the JAAS authorization component works in conjunction with the core Java SE access control model to protect access to sensitive resources. Access control decisions are based both on the executing code’s CodeSource and on the user or service running the code, who is represented by a Subject object. The Subject is updated by a LoginModule with relevant Principals and credentials if authentication succeeds. SampleAcn.java contains a sample application class (SampleAcn) and another class used to handle user input (MyCallbackHandler). 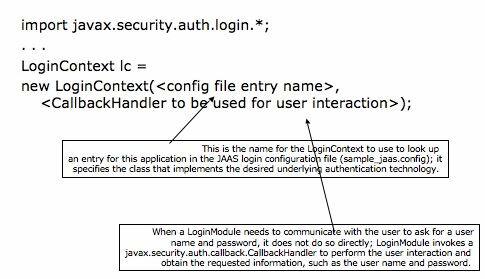 SampleLoginModule.java is the class specified by the login configuration file as the class implementing the desired underlying authentication. SampleLoginModule’s user authentication consists of simply verifying that the name and password specified by the user have specific values. SamplePrincipal.java is a sample class implementing the java.security.Principal interface. It is used by SampleLoginModule. CallbackHandlers and Callbacks enable the LoginModule to gather user credentials. The JAAS framework defines the term subject to represent the source of a request. A subject may be any entity, such as a person or a service. Once the subject is authenticated, a javax.security.auth.Subject is populated with associated identities, or Principals. A Subject may have many Principals. Call the LoginContext’s login method. The LoginContext instantiates a new empty javax.security.auth.Subject object (which represents the user or service being authenticated). The LoginContext constructs the configured LoginModule (in our case SampleLoginModule) and initializes it with this new Subject and MyCallbackHandler. 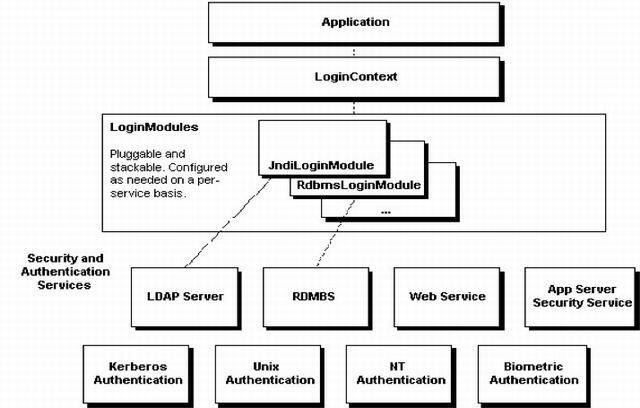 The LoginContext’s login method then calls methods in the SampleLoginModule to perform the login and authentication. The SampleLoginModule will utilize the MyCallbackHandler to obtain the user name and password. If authentication is successful, the SampleLoginModule populates the Subject with a Principal representing the user. SampleLoginModule.java implements the LoginModule interface. 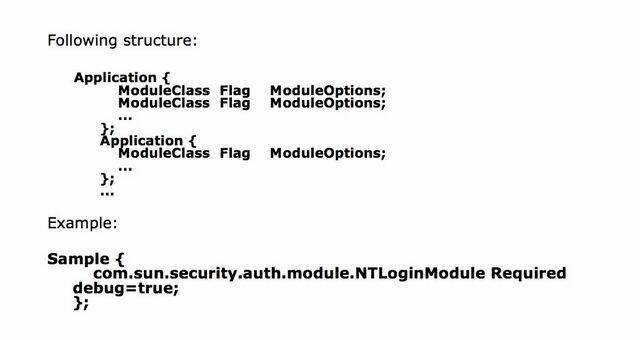 SampleLoginModule is the class specified in the configuration file as the class implementing the desired underlying authentication. SampleLoginModule’s user authentication consists of simply verifying that the name and password specified by the user have specific values. If authentication is successful, the SampleLogin Module populates a Subject with a SamplePrincipal representing the user. When an application uses JAAS authentication to authenticate the user (or other entity such as a service), a Subject is created as a result. The purpose of the Subject is to represent the authenticated user. A Subject is comprised of a set of Principals, where each Principal represents an identity for that user. Permissions can be granted in the policy to specific Principals. The Java runtime will automatically determine whether the policy grants the required permission only to a specific Principal and if so, the operation will be allowed only if the Subject associated with the access control context contains the designated Principal. ….to read only the files included in the ‘/cdrom/duke’ directory. The Subject authenticated in the LoginContext must be associated to a Prinicipal whose getName method returns ‘duke’. The policy must specify the information Codebase and SignedBy, too. The user must be authenticated. permission perm_class_name “target_name” , “action”; …. The doAs method associates the provided Subject with the current Access Control Context and then invokes the run method from the action. The run method implementation contains all the code to be executed as the specified Subject. The action thus executes as the specified Subject. The static doAsPrivileged method from the Subject class may be called instead of the doAs method. In addition to the parameters passed to doAs, doAsPrivileged requires a third parameter: an AccessControlContext.